Thank you for signing up to volunteer! WATCH D.O.G.S. will be on campus Monday through Friday from 7:20 am to 3:30 pm starting October 15th, 2018. 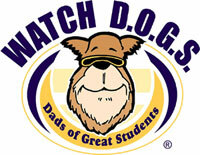 In order for each Father or Father-figure to have an opportunity to volunteer WATCH D.O.G.S. will be limited to one day per family for the school year. All volunteers, including WATCH D.O.G.S. are required to complete the PISD Volunteer Application annually. The application can be found through pisd.edu. If you need to change your volunteer date, please log back in to the SignUp Genius site and change your volunteer date. Thank you for making a positive impact at Rose Haggar Elementary! Teacher’s lounge; free ice and water, and use of a refrigerator.